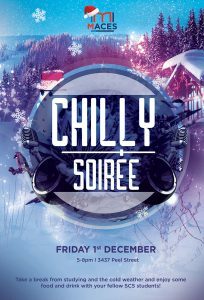 Join the MACES CHILLY SOIRÉE! WHAT: Take a break from studying and the chilly weather to enjoy some food and drinks with your fellow students at the annual MACES holiday party. It’s on us! Take a break from studying and the chilly weather to enjoy some food and drinks with your fellow students the annual MACES holiday party.